June-bearing. 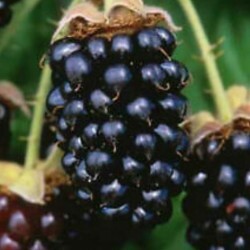 Originated in Oregon as a cross between the Chehalem and Olallie Blackberries. 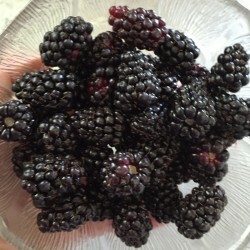 It's berries are large, bright black, and excellent flavored. Recommended for fresh eating, jams, preserves, and desserts. 2-year old plant divisions that will bear fruit this year when planted early in spring. 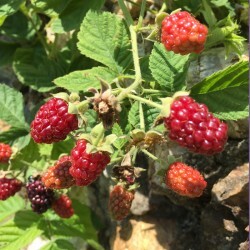 My favorite blackberry, it's a great grower with a bountiful harvest of large berries that are great for any use one can think of. 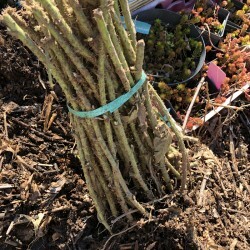 Vigorous, thorny plant, strong canes that do well on horizontal supports. Berries have few, very small seeds and ripen in June and early July in warmer areas, July to August further north. Proper planting depth is most critical, the crown should be planted 1½ - 2 inches below soil level.